When I was a kid I owned a small mountain of comic books. I was not a discriminating collector. My grandmother took me to yard sales where we’d buy tall stacks of yellowed, coverless magazines which I’d bring home and pore over while she sewed. Though my tastes were ecumenical, I found I preferred uncomplicated characters like Uncle Scrooge McDuck (who liked two things: money and adventure) to say, Spider-man (who didn’t really like anything, and was always in the middle of some existential crisis. Come on, Spidey, snap out of it!). 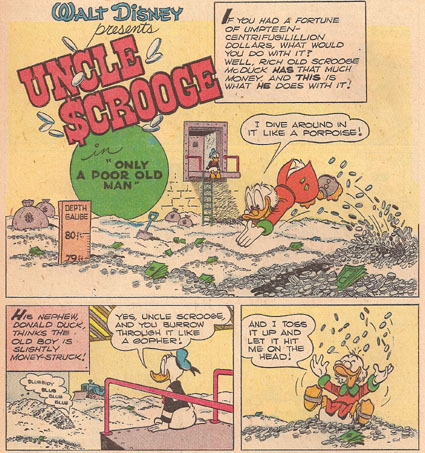 The best Uncle Scrooge and Donald Duck comics were written and drawn by Carl Barks, widely regarded as one of the greatest cartoonists of all-time, who labored for Disney in relative obscurity until the mid-1960’s, when he was slowly discovered, and fêted by, legions of Uncle Scrooge fans. At this point Barks started producing kitschy duck oil paintings that were not nearly as satisfying as the simple pen and ink originals on which they were based. Animation/comic historian Michael Barrier wrote this lovely essay on Carl Barks and Uncle Scrooge for the Wall Street Journal, who declined to publish it.